THE BEST WATER. PUR� AND SIMPLE! 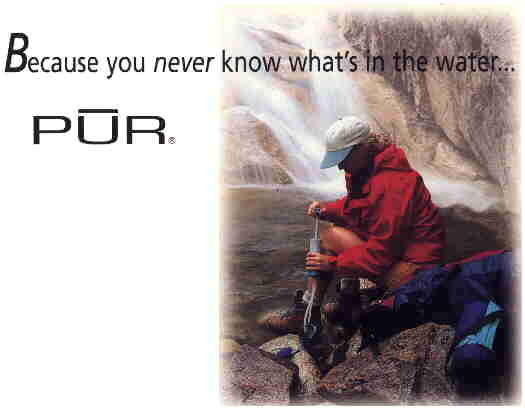 AND ONLY PUR water purifiers have it !!!! systems reduce lead, sediment and certain harmful contaminants, as well as chlorine, which has been known to affect taste and odor. PUR filters are available as pitcher/dispensers, faucet mounts or countertop/undersink units. Monitor� Gauge, which tells you when your filter needs replacing. cryptosporidium as well as other harmful contaminants. (about 2-3 months) of quality water. If you need, want or enjoy a water filter Get a Pur- you won�t be disappointed rather you�ll be very pleased!! !Check out their web site www.purwater.com.